Starting from the end of 2017, Scrum.org has put more emphasise on servant-leadership for Scrum Masters. After all the Scrum Guide explained that the Scrum Master is the servant leader of the Scrum team and the organisation she belongs. Servant-leadership is not new to me. Well, at least I’ve heard about it every Sunday service at the church since I was 5 years old. Robert Greenleaf himself who first promoted the concept of servant-leadership to the world was inspired by the stories in the Bible. But even though the concept of servant-leadership is not new to me, I feel it is quite challenging to present it both visually and verbally in the PSM class because to teach servant-leadership you have to demonstrate it, you have to be that guy, otherwise, people will only get the theories in the class. Over the years, I have used these simple guidelines when teaching about Scrum Master as servant-leader. I hope it will help you as a Scrum Master to be a servant-leader too. The difference between servant leader and other types of leader, servant leader is a servant first than a leader first. Being a servant leader means you are committed to putting your personal interest last. In other words, servant leadership is a commitment to humility. Being a servant leader is not about your success but it is about the success of those you are serving. You are not the center of the attention, the people whom you are serving should be the center of the attention. We are currently living in the world where people like to brag about their success on social media, servant leadership is not about bragging your personal success. 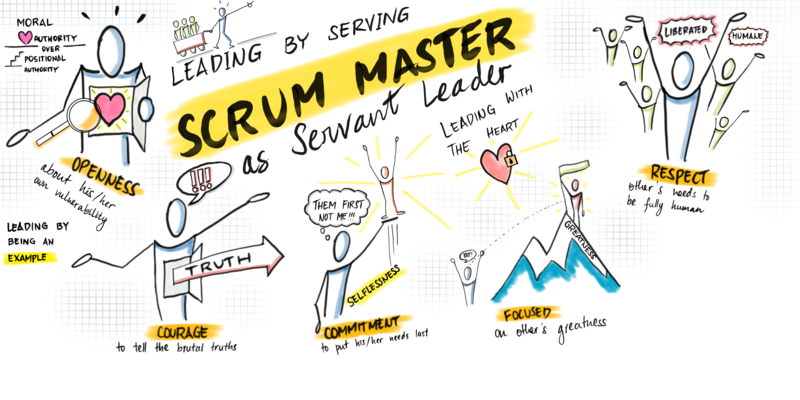 If you brag about your success or your capability as a Scrum Master or about the project you delivered successfully using Scrum, I am sorry to say that is not servant-leadership. None of that success belongs to you, it belongs to those you are serving and you have no rights to claim it as yours and brag about it. I often get questions about the career path of a Scrum Master in a company from others, it seems they're concerned as a Scrum Master they will stay in the same position for the rest of their life. The growth of a Scrum Master should not be seen by her rank in the organisation chart but by the impact of her service. While there are many leaders in the company who fight their way up in the organisation ladder, I am sorry to say but servant leadership is not about fighting your way up in the organisation chart. By keeping this in mind you will be laser-focused to serve others and stay away from corporate politics, stay neutral and unbiased. It takes great humility to put yourself last to make a way for others to be successful. I have met many people who asked me, “if my team are not delivering as expected should not I punish them?” Many also asked me, “if there is a team member who is not delivering as much or as fast as other team members, shouldn’t I punish that person?” Many companies and leaders are stuck in “reward & punishment” model for years. I am sorry to say that this style of leadership is no longer relevant for the 21st century because it is not humane. The era of using stick & carrot to punish underperforming workers is already over. We’ve passed it and we should leave it behind in the previous century. The traditional model of punishing under-performant never makes any sense to me personally. It just feels wrong. A servant leader should help an under-performant and lift them up to be greater. A servant leader is always at service to make others great instead of punishing, blaming or judging them. Scrum Master ask under-performant “what can I do for you so that you can be great and get you out of this situation?”. Your goal as a servant leader is not your greatness but other people’s greatness. You may need to walk the extra mile or sacrifice your personal resources to make them great. “But, but, but what if we have tried to coach that person and he still does not change?” I personally believe that human being is a creature of growth. Nobody wakes up in the morning just to be at their worst performance. Rather than making a conclusion based on what we see, we should see the story through their lenses rather than ours. We should look into ourself first whether we’ve already continuously improved ourself to be a great coach. A servant-leader is the kind of leader who is proactive to get to the heart of the problem so that she can make other people awesome rather than making conclusions based on what she sees. By focusing on the greatness of others, we will be less judgmental towards others and we will make others feel safe being around us. A servant leader focuses on creating an environment where people can thrive and become the best version of themselves rather than an environment where people become defensive and have low self-esteem. We have lived under the beliefs where the workplace is the place about work only and outside of that system is where we can be fully human. Many companies promote the concept of work-life balance because they believe workplace is about work and outside of that system is about life. You don't have a life in the workplace. In this belief, people need to shut down their human side and leave it behind at home every time they enter the workplace. I personally believe that being fully human is a basic need and it shouldn’t be shut down. People need to be human whether they are in the workplace or outside of the workplace. A servant leader does not differentiate a person inside and outside a workplace. A servant leader cares about the well-being of her people at the workplace. A servant leader is personally interested in her people as a human being. She is a people person. Compassion may not be a common word we hear in corporate settings, but as a servant-leader, we need to be compassionate and curious to be personally interested in the people we are serving. And to be compassionate and curious you need to be genuine, you can not fake it. I still remember a saying my old boss told me, “don’t come to me with a problem, come to me with a solution”. I always feel uncomfortable every time I hear someone say that. It doesn't sound right, even though many people I know believe this is the standard belief in management. That belief makes me feel discouraged because I feel that I need to get approval from my boss. If I can't come to my boss with my problem, who else can I trust to help me with my problems? Within this belief, it seems I need to be perfect, I can't be wrong and I can't make mistakes. A servant leader creates an environment where people can feel safe to be fully human at workplace just as people also feel safe to be fully human when they are amongst their friends and families. It should be okay for her people to say “I don’t know” or “I failed, I need help” without any fear of judgment or punishment at the workplace. A servant leader invites people with an open hand when they have a problem rather than telling them to come back later with a solution. We are there to be at their service. It should be okay for her people to create space and time for reflection about their mistakes. It should be okay for people to do an experiment that will bring value to the company without feeling any fear of failure. A servant leader has the courage to tell the truth even though it will make others uncomfortable or even resistant. She does not sugar coat any of the messages she sends because she wants her people to improve and have a new experience. She walks the talk and every bit of her message has integrity in it. The truth may not be what people are used to hearing in the past because the truths create no space for politics. A servant leader is not playing it safe and does not have any fear to tell the truths because she knows her goal is the greatness of others. A servant leader will tell the truths regardless how difficult it may be for her to do it. Sometimes it may cost her job. A servant leader is unbiased and does not have any favorites, otherwise, it will lower the quality of the service she brings to the whole organisation. Telling the truth never feels comfortable for many people because we are afraid that the truth will hurt others or it will cost us our future in the workplace. Sometimes we only tell our boss what he wants to hear because we are afraid to be punished or will not get his recognition. A servant leader is different. A servant leader is genuine, she has no hidden motives and no personal interest in her message.The truth spoken will bring the people and the organisation she is serving to a new height not to hurt them. The truth will push people to think differently rather than staying at status quo or being comfortable in a comfort zone. A servant leader creates an environment where people can feel safe telling the truth and telling the truth is the norm. We have seen from the previous points above how servant leader focuses on serving others for the greater good. A servant leader is also a leader who has the humility to be open about her own vulnerability. A servant leader has the humility to say that she does not have all of the answers to all of the problems and any advise she gives does not serve as the absolute truth. A servant leader has the humility to not brag about herself and at the same time is open about her imperfection. Many think that when a leader is open about her vulnerability, it is a sign that she is weak. Some may even say she is useless. After all, in corporate settings, we are measured by our capability, so being open about our own vulnerability in the public is automatically seen by others as our incapability as a leader. Being open about our own vulnerability is a form of service to others so that others can feel safe to be open about theirs too. This is the only way we can get trust from the people we are serving. We can serve others to be greater when we have gained their trust and they are open to their own vulnerability. People will feel comfortable and have no fear of judgment when the leader has the courage to be open about her own vulnerability. People will trust the leader and will feel safe to be open about their own vulnerability when the leader demonstrate openness about her vulnerability to her people first. By demonstrating openness about our own vulnerability, we are creating the impression that "it is human to be imperfect and it is not wrong to be human at work". It takes humility to be a servant leader. It is not easy to be a servant leader when servant-leadership is not the standard applied by many companies or leaders in our society. It is personally never been easy for myself. I personally still struggling to be a servant leader until today. It is not easy being a servant leader. But I believe being a servant leader is what make us different compared to other leaders and what can bring a difference to this world. I used the guidelines above as an impetus for myself to keep on improving my servant-leadership skills. I hope it can help you too. Happy Holiday everyone. Looking forward to seeing the result of your beautiful work as servant leaders for many years ahead. Are you exploring how you can improve your servant leadership in the organisation and in the team? Check out our Advanced Professional Scrum Master Course.